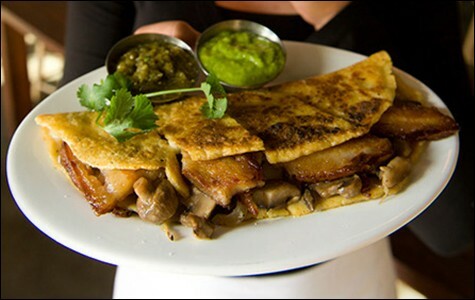 Though it's not on the menu, the pork belly quesadilla is available at Cosecha. To distill a culinary imagination into one menu — a reasonably small paper rectangle — is, in some ways, like attempting to straightjacket ether. By the laws of nature, it will leak and seep beyond the boundaries. In professional kitchens, this overflow shows up as a secret menu, a backlog of hidden dishes, wrought from odd bits and off cuts, from fleeting ideas that break the taste bank open. Often, it's the best place to mine. Spice Monkey might be located in a former antique tile showroom, but make no mistake: The restaurant is a spice house. Kanitha Matoury, a whirling cook who travels the world collecting inspiration and ingredients for her menu, crafts all of her own spice mixes, and she hides away her strange inventions in a back room. The most interesting dish is a perpetual work in motion, a freak concoction she calls the "Weird Pickle Stir Fry," which showcases Matoury's pickling endeavors. It includes a strange, pungent mix of Cara Cara oranges and squash spiced with ginger, cloves, turmeric, allspice, and a truckload of other seasonings, which is stir-fried along with crisp green beans and served over rice. Accompanied by an assortment of pickles — including nine kinds of eggplant, something she calls her "zesty slaw," a vinegar-based pickle, and another seasonal pickled vegetable, the platter is a fermented goldmine flush with the most atypical spices for pickling. It's like nothing else around, and, accordingly, is best approached with an open mind. At Dominica Rice's Cosecha in Swan's Market, the menu is short and refined, with a few secrets tucked in the cracks. Rice is an alum of Chez Panisse who's been dishing out some of Oakland's best Mexican food for a little more than two years now, and occasionally you'll catch her sliding a plate of cheesy pork on bread to her daughter who works there. It's the kind of off-menu gem I wished she'd slide it at me. But for now, it stays in the family. 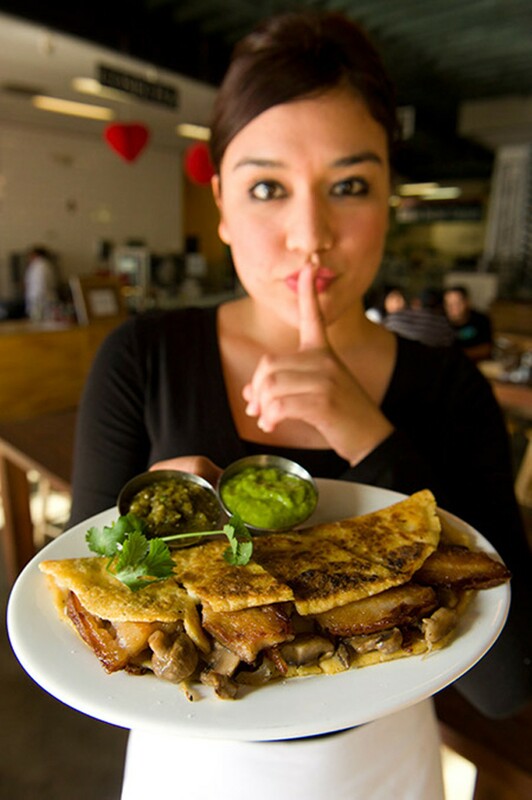 For the rest of us, Rice makes a fantastic rendition of her own quesadillas with pork belly swaddled in warm stringy swaths of Oaxacan cheese. Christina Bondoc's Temescal bakery recently expanded into a full-service restaurant, and the payoff has been grand. Bondoc, a pastry chef, has made some interesting discoveries by way of adapting to her recently discovered gluten intolerance. The solution? Fermenting grains and using heirloom wheat. Her sourcing philosophy stays especially close to home, trading her baked goods for sausage with the folks at Hog's Apothecary, and sourcing grains from neighbors like Community Grains. On certain days, usually at the beginning of the week, an old sandwich reappears like the blue moon, but it's never on the menu. It's stacked with corned beef from The Fifth Quarter and red cabbage slaw, slathered with house-made whole grain mustard and slices of smoked cheddar. The tragedy is that it's fleeting, since it depends on meat that's too expensive to keep on hand all the time. So, you heard it here. For best luck, ask on Mondays. FuseBOX is the promised land of secret menu items. Chef Sunhui Chang and General Manager Ellen Sebastian Chang toe the line with an inspired set of constantly shifting flavors. They cherish experimentation and rubbing up against boundaries, reserving Tuesday nights for testing out new dishes on willing customers. To get the special stuff, take the time to get to know the restaurant's staff, and let them get to know you. If you're lucky, you'll find yourself face to face with hamachi collar or sea bass belly, and or maybe some rogue leaves of Brussels sprouts rolled as tightly as fists, speared with a skewer, and drizzled in the nectar of boiled-down chicken bones, soy sauce, and brown sugar. The dish is a labor-intensive joy to behold, and tastes like woody fire on a cold damp day. Sebastian Chang is particularly given to spreading the love, to splicing stories with food. The menu is unconfined by the palate and preferences of the outside world, and holds only to one law: to cook honestly, and with love. The mantra makes for a menu that, with time, continues to drop secret manna on its biggest fans. A guide to the East Bay's best — and most short-lived — dishes.